I am a chronic over-paker. I can easily take a week's worth of clothing on a weekend trip to visit the boys' grandparents, so packing for a four day sojourn on an island is basically like planning to survive for three months in the Amazon. Additionally, if I make the smallest error in my preparations, such as miscalculating the proper diaper per day ratio or forgetting my eye-makeup remover, I will clearly be struck down by the packing gods and publicly humiliated for the rest of my mortal life. Obviously. I started preparing weeks ago, ordering items that have no place in my everyday life: a microfiber travel towel, a swimshirt, and (gasp) even a pair of shorts. For the boys, I bought matching Superman rashguards, tiny sunglasses, and hats. B1 got a new backpack, and as official concession to my status as an Orange County suburbanite, I even caved and got one of those collapsible wagons, the ones I used to look down my nose at while in line at the farmers' market. At least I don't have to drive a minivan. So, now, at T minus 18 hours, I have crossed off most of the items on my three-page list and highlighted the items I still need to pack tomorrow. I have washed the vast majority of the dishes and put at lest the boys' room in a condition that will not bring me to tears when we return. B2 is asleep, B1 is in the shower, and perhaps, if every single one of my Ts are crossed and my Is are dotted, then maybe, just maybe, I will get on the boat tomorrow without having a panic attack. 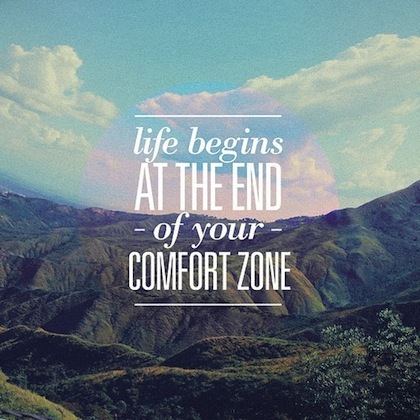 If life really begins at the end of my comfort zone, then maybe I need to rethink the entire plan. It's only after you actually live on the island or commute there for work that you get really good at that trip. And really, if it was just you and Husband? So much easier! Children are complicated. Way too complicated for me.